Thanks.. i like this nice template..
How do I fix the date problem??? How to reduce the height footer area? replace margin: 0 auto 80px; to margin: 0 auto 20px; or change 80px to any value u want. Just one more help needed. How to add pagination in this template? Please see this file as use of tags is not allowed in comments. 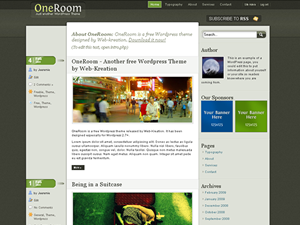 Thank you WP Blogger Themes for a giving us bloggers a great resource. My Problem: My blog description area is showing up very dark (#333333) thus fading into the background. The color seems to be inherited from the page body color. If I change that to white it throws other sidebar colors off. Is there a way to change blog description font color without affecting the body color? Thanks tmwwtw that fixed it. After looking at it I kinda like it better with the description @ top center in the text area. Is there a way to hide the description (Without hiding it from search engines)and just use the text area? If I un-check it in blogger settings would it also be hidden from search robots? Is there any way to place a conditional statement in the code, so that based on what author releases a post, a different picture will show up next to his name in the left-hand toolbar? So instead of the generic "little dude" outline picture in the left toolbar, there could be an image from photobucket based on the author. I absolutely love this template, thank you. I Love the one room template and all was great until I changed PC! Now running IE8 on a windows 7 OS, the template will not display properly! I get the same problems when clicking the blogger demo! No backround or graphics will load, showing only a white section for whole width of page. The wordpress demo displays perfectly! Is this likely to be a glitch with the blogspot transfer from wordress theme, when run on IE8? blogger link is gone..please help! Wow! Wonderful Themes. Thank you so much for sharing.